US dollars (in perfect condition) and Nepalese rupees- which currency they ask for seems to be randomly decided, so bring both! The embassy is open for visa applications from 9:30 am to 11:30 am, but queues start forming outside before the doors open. When you enter, your bag will be searched and you will be asked to walk through a metal detector. The security guard will give you your visa application form. Fill out the form, including your personal information, passport information, work details, parent names and contact details, your planned itinerary for your time in China, whether you would like express service for your visa, and the type of visa you are applying for ( NOTE: The Chinese embassy in Kathmandu issues single-entry visas ONLY). Stick your photo onto your form (there is glue on the table in the foyer- the person at the visa application counter will not do this for you!). Queue up for the counter that says “Chinese Visa Application”. You may be waiting a while! Hand over your passport, completed application (with glued-on photo), passport photocopy and hotel booking. 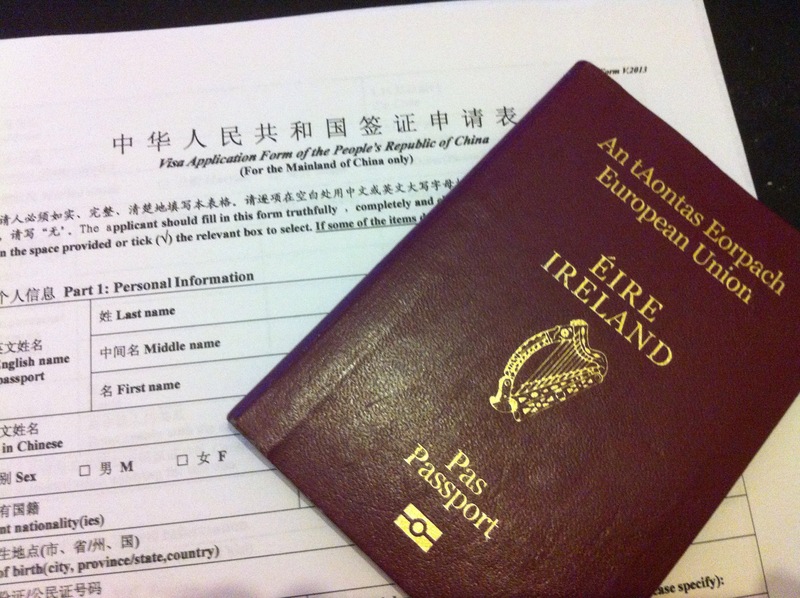 You may be asked a few questions regarding your form or your plan for your time in China. You will be given a piece of paper with the date and time to collect your passport and the cost you will have to pay. Wait until your visa is ready- this usually takes 4 days, but you can pay extra for the express service and pick it up the following day. Return to the embassy and queue for the collection counter. Show them your paper, and you’ll be given a bill with the total cost due. There will be an additional processing cost of US$3, plus extra if you selected express service. Queue up for the payment counter. You will be given a form to write the serial numbers of each bill you are giving. Only new bills in perfect condition will be accepted (I had to use a different bill because mine had a tiny tear in it). After you pay, you will be given a receipt, which you take to the collection counter and receive your visa. Our visas (one English and one Irish citizen) cost US$37 each, with an additional $37 dollars each for express service, and $3 dollars each for an administration fee. While the Chinese embassy in Kathmandu only issues single entry visas, embassies in other countries may issue visas for double or multiple entries. However, if you do not have proof of exit and entry (i.e. a plane, train or bus ticket), your application for double or multiple entry may be rejected. Tourists with certain professions, such as anything to do with the media, may only be allowed a one-month visa, valid from the date of application. Hopefully this has given you all the information you need to apply for your Chinese visa in Kathmandu. If you’ve any questions, feel free to ask in the comments! Hi! flights in and out were not required in your case? Hi, we did have flights in and out, so we gave a copy of our itinerary when we applied. If you don’t have one then some travel agencies in Kathmandu will reserve a ticket free of charge, print you a copy for your visa application and then you can cancel the reservation. Happy travels! Silly me left flights off the list in the original article, so I’ve added it now. Thanks for pointing it out! This was super helpful….thank you! You’re very welcome 🙂 Good luck with your visa and enjoy your trip to China! I like the helpful info you provide to your articles. I’ll bookmark your blog and take a look at again here frequently. I’m quite sure I will be informed many new stuff proper here! Best of luck for the next! do we need a bank balance statement to apply for China tourists visa, if so, how much is the minimum bank balance statement for how many months required for minimum. We brought bank statements when we applied for our visas, but it turned out we didn’t need to. It’s best to have one in case you’re asked, though the guidelines don’t specify how much the minimum amount needed is. I just came across your post, very helpful since i’d like to apply for a Chinese visa in Nepal too. Due to various reasons, it would be great if I could pick up my passport the same day as applying. I noticed on the embassy website they also have an ‘extreme urgent’ option, would that be an option for me? The fast track option (drop off and pick up on the same day) is only available to certain nationalities. If you can’t find the information on the embassy website, it might be best to contact the embassy directly. Let us know how it goes, and enjoy your time in China (and Nepal)! Any thoughts on getting a business visa there? I will have all of my paperwork but can they process this? I don’t see why they wouldn’t be able to process a business visa, though it’s best to check with the embassy directly just to be safe. So I am currently in Kathmandu and will be doing the Base Camp Everest Trek in a couple of days! I was wondering if I went to the Embassy at the airport (I’m assuming that is where it is!) To apply for my Visa, and then wait for everything to process, if I can return 2 or 3 weeks later after my trek to pick it up. The embassy is not at the airport, it is in the area of Hattisar, Naxal in Kathmandu (taxi drivers should know where to take you). I don’t think there would be a problem with dropping off your application and then picking up your visa 2 or 3 weeks later, however it is best to contact the embassy directly regarding this. Also, you would need to leave your passport at the embassy during this time, so you would need to make sure you wouldn’t need your passport during your trek. Let us know how your application goes! Hi Ailish, thank you for this information, its very useful! I am hoping I can get a chineese visa in Nepal in April, for travel there at the end of June, but I am not sure how long the visa is valid for… do you know? We got a one month visa (single entry only). I’m fairly certain they were offering three month visas as well. Information changes all the time, so you should go to the embassy as soon as you arrive in Nepal to find out. Happy travels! Thanks for your helpful post! My husband and I will be visiting friends in China and wouldn’t be able to provide hotel information, as we will be staying in their homes. Do you know if a letter of invitation from the friends an acceptable alternative to the hotel documentation? I forgot to click to receive an email on my last comment….sorry for this extra comment to do so! Helpful blog! I’ll be travelling next september through Nepal and China and hope to travel from kathmandu to Tibet and take the tibet express from lasha to Lasha and take the train to Beijing. Can you maybe inform me how I can get the necessary permits for tibet and china? Thanks in advance! is it ok if I print the application form by myself rather than taking from the embassy? I’m sure this would be ok, if there is a copy available to print. I just went today and they increased the price substantially!! 15,000 rupies for standard visa. What is it to get your visa ? Could you tell me how long did it take to get your passport back ? Currently i am in kathmandu.i had been to china 1 year before as student visa and again i want to back china.can i get working visa? if can get then what are the procedure i need to follow to get working visa. HI! I have a backpacker friend who is travelling via land. He wants to enter China obviously via Tibet. Does he need a special extra permission for Tibet when applying for the Chinese visa? Hi Silvia, I’m afraid I don’t know what the current travel arrangements are for Tibet. It’s best if you contact the embassy directly. Happy travels! Thanks a lot for the info, it really helped me! 🙂 Safe travels, J. Thanks for the very useful post! For updated info I went today (April 16, 2018) to the embassy in Kathmandu and in addition to the documents you mention they requested printed booking for accommodation throughout my time in China, (not just the first few nights) and a copy of my Nepalese visa. How can i apply from nepal? I want to go to mert my friends over there.i am from nepal.total how much it cost?